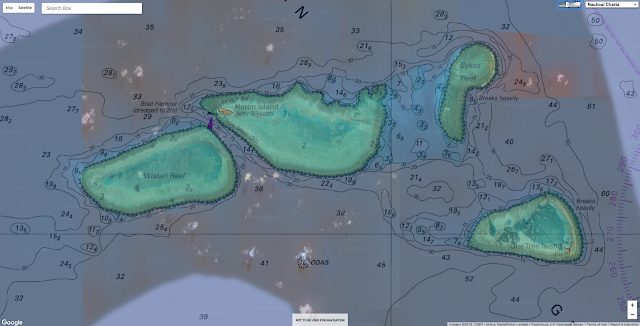 A visualisation of the Great Barrier Reef based on a joint project between Geoscience Australia, James Cook University and the Australian Hydrographic Service. The visualization shows the Great Barrier Reef sea floor in unprecedented detail. 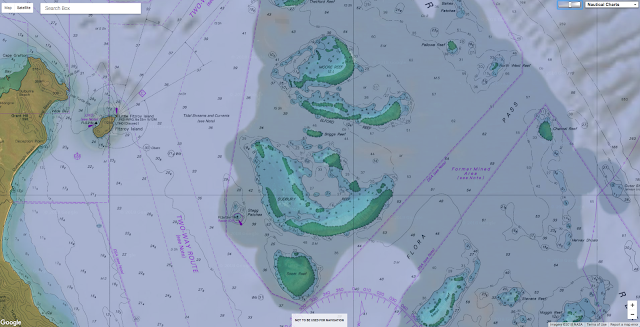 The bathymetry dataset is produced at 30 metre resolution using a combination of historical and new sea floor mapping data and is a vast improvement on the previously available 250 metre resolution dataset. 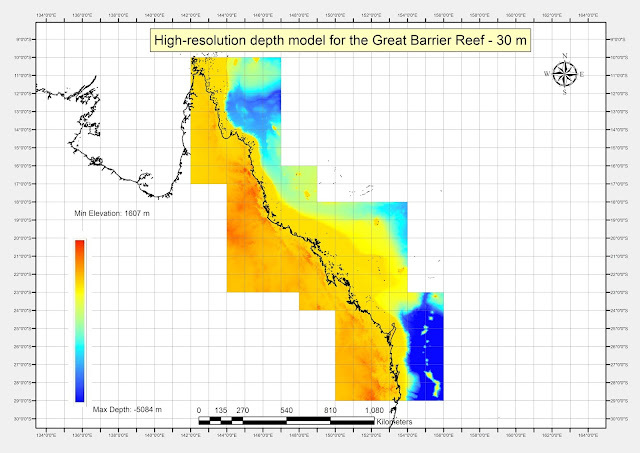 The new dataset covers an area of 1.7 million square kilometres and provides a unique understanding of the structure of the Reef. High-resolution sea floor maps released today show 1.5 million square kilometres of Australia's iconic Great Barrier Reef in unprecedented detail. 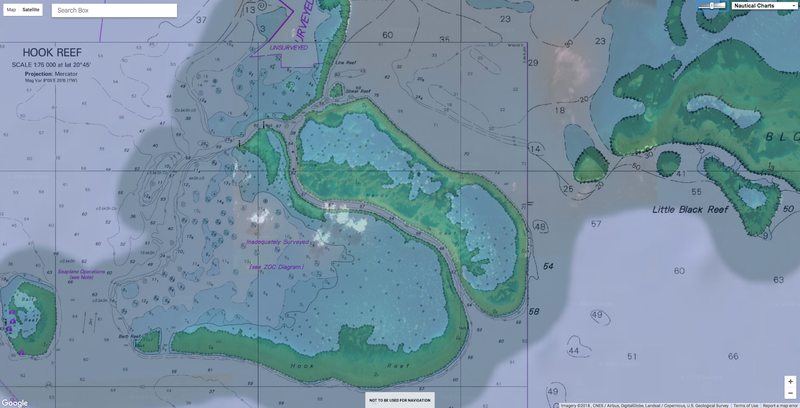 The maps are the product of a collaborative project between James Cook University, Geoscience Australia and the Australian Hydrographic Service. 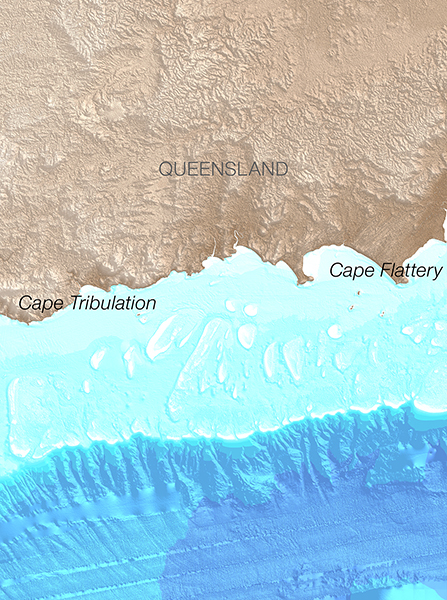 This is the first high-resolution mapping of the sea floor of the entire Great Barrier Reef. Attribution: "Australian Hydrographic Service, Geoscience Australia, James Cook University"
JCU's research leader, Dr Robin Beaman, initiated the project in 2009. "The Great Barrier Reef data is the first in a series of '30-metre' datasets that will be released as part of this project. This represents the highest resolution depth model of the Great Barrier Reef, to date," he said. "We're using cutting-edge scientific techniques to combine historical and newly-acquired bathymetry (undersea mapping) data of the entire northern coastline of Australia," he said. 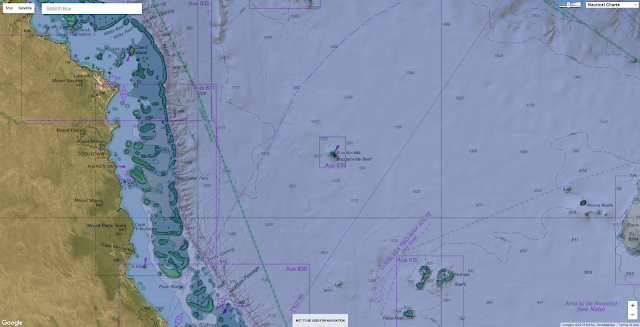 "Along with the quality of the new data we've acquired, we've also been able to access undersea mapping data collected over the past few decades by government and university research programs." "Our partners at Geoscience Australia will be releasing open source data of large parts of the coastline as it becomes available. The grids we've built will enhance our understanding of the terrain of the sea floor in shallow waters off the coast of northern Australia." Chief of Geoscience Australia's Environmental Geoscience Division, Dr Stuart Minchin, said he was pleased that his team was able to get on board and support this important project with such wide-ranging potential. "The dataset we've released today maps the entire Great Barrier Reef with data that is around eight times higher resolution than what was available previously. This is a vast improvement and it creates huge opportunities for the scientific and policy community, most importantly for the environmental management of the reef," Dr Minchin said. "Having greater knowledge of the shape of the reef will be a critical tool for the government agencies responsible for its protection. This gives those organizations a far more detailed view of the reef with which they can identify new reef structures and coral formations. "Bathymetry data is also an important input for oceanographic modelling which can be used to improve our knowledge of climate change impacts, marine biodiversity and species distribution. It will also support modelling of tides and ocean currents. "We've been able to support the team at JCU, who are specialists in this kind of marine research by contributing our resources and expertise to the project. We've also worked with the Australian Hydrographic Service to bring their vast stores of marine mapping data into the project as well. "Collaborating with these organisations over the past four years has seen us map the entire northern Australian coastline, including the Great Barrier Reef. 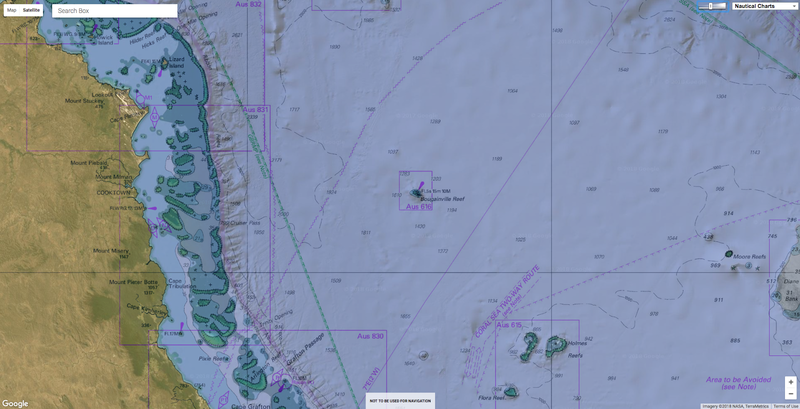 We saw the value in JCU's work and the potential of these high-quality datasets to provide greater certainty on Australia's maritime boundaries for government and other maritime operators." Northerly view of Hook and Line Reefs off Airlie Beach. Depths are coloured red (shallow) to blue (deep), over a depth range of 84 metres. Easterly view of Sudbury and Moore Reefs off Cairns. Depths are coloured red (shallow) to blue (deep), over a depth range of 100 metres. Westerly view of One Tree and Heron Reefs off Gladstone. Dr Beaman said he was pleased that the Great Barrier Reef bathymetry was the first dataset to be released, given the reef's unique marine environment. "Being based in northern Queensland, JCU prides itself on being at the forefront of scientific research when it comes to the reef; we are committed to providing government and researchers with information that will ultimately help protect it," he said. 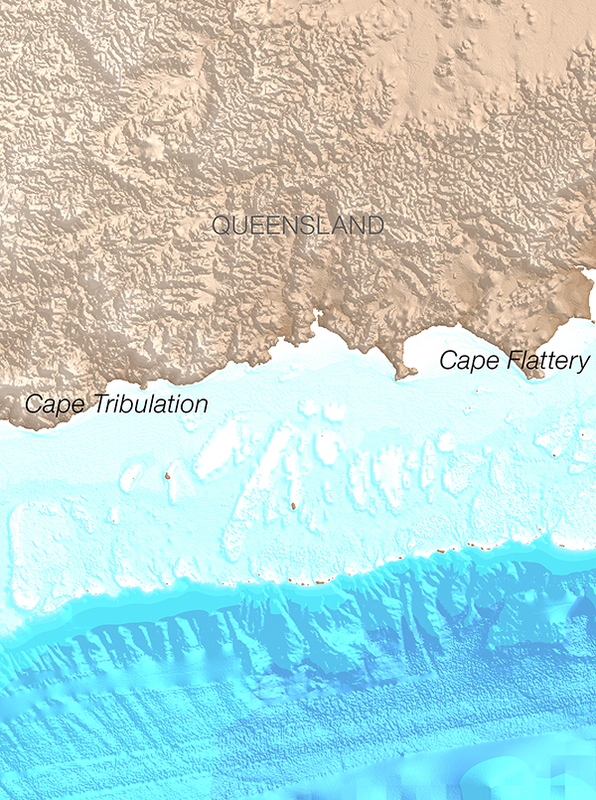 The series of datasets produced through this project will provide a detailed view of the marine geography of Australia's northern coastline, providing greater certainty on the location and extent of the country's maritime boundaries. The datasets will support safety of life at sea, the enforcement of law, and government operations. When Captain Cook's ship the Endeavour first entered the Great Barrier Reef on 20 May 1770, Cook found an 'insane labyrinth' of coral. The ship ran aground on what is now called Endeavour Reef. 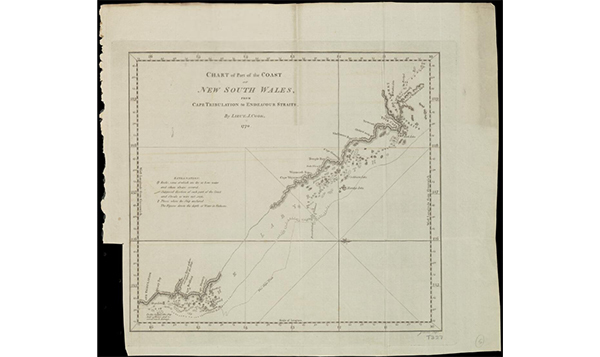 Captain Cook made painstaking maps of the region, such as this section from Cape Tribulation to Cape Flattery. The new 30 m bathymetry grids of this region show it in extraordinary detail.